Combine Spicy Corn Relish, bell pepper, avocado, cilantro and lime zest in a medium bowl. Season with salt and pepper. Rinse tomatoes. Carefully cut a slice off the top and save to use as a cap. Scoop out and discard the pulp of the tomato using a small spoon. Turn the tomatoes upside down on paper towels to drain about 15 minutes. The tomatoes can be covered with plastic wrap and refrigerated at this point one day in advance. 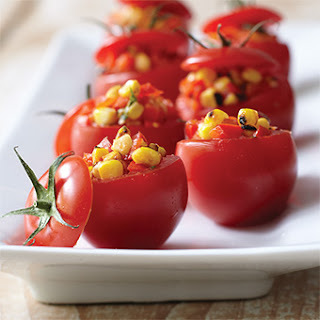 Fill each tomato with corn relish mixture and top with cap. Serve cold or at room temperature.